This is a Heijo-kyo's character called Sentokun. I think it is a strange character. He is a boy with two deer horns. We say he is kimokawaii. kimokawaii consists of two Japanese words 'Kimoi' and 'kawaii'. It means ugly and cute. You think why he has two deer horns. There are a lot of deer in Nara park. Plus, you shouldn't use kimokawaii to people. Especially the young ladies. Now There are a lot of events for the 1300th Anniversary of Nara Heijo-kyo Capital. 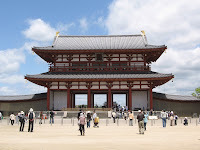 If you come over to Japan, you should go to Nara prefecture. And it is nice season on May. June is rainy season. Also summer season is very humid in Japan. Actually If you have free days of weekdays, I will go to trip Nara. Maybe it is very crowded on holidays. Paleo Express is a steam locomotive train which runs in Chichibu region. We enjyoy to ride Paleo Express.